Janay McClarin is the NAPE Program Manager for the Southeastern Region and has spent the past 20 years passionately working in the fields of service, education and youth development. She began her career as a Law Enforcement Officer in Jacksonville, Arkansas serving as a Community Resource Officer and later as a Corporal for the State Capitol Police. Janay relocated to Washington State where she was Dean of Students for the Kent School District and was the staff trainer for classroom management. She transitioned to the non-profit sector as the Director of Impact for City Year in Seattle and oversaw the implementation of programs focusing on service learning, student achievement and increasing graduation rates. 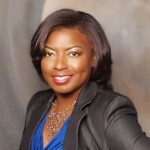 Prior to joining NAPE, Janay served as Program Director for Girl Scouts in Central Florida where she expanded community partnerships with an emphasis on STEM opportunities. There she launched programs such as Not Your Mother’s Career Fair and Earn Your Lab Coat as platforms to encourage girls to think outside the box and pursue nontraditional career paths. Janay holds a BA in Criminal Justice from the University of Arkansas at Little Rock where she served as a mentor for nontraditional students. She also received a BA and a MBA from Columbia College.